Out of all the wed­dings I have pho­tographed, this vibrant wed­ding at Casitas Estate was one of my absolute favorites. With breath­tak­ing views sur­round­ing the per­fect­ly main­tained grounds fea­tur­ing a beau­ti­ful rose gar­den, a cer­e­mo­ny site sur­round­ed by a vine­yard and a love­ly lawn with fairy lights for the recep­tion, it’s hard to imag­ine a wed­ding venue bet­ter than Casitas Estate. For Patrick and Julie, who live up in San Fran­cis­co, hav­ing their wed­ding at Casitas Estate let them keep the wed­ding small and inti­mate. Once they decid­ed on Casitas Estate as the venue, every­thing start­ed falling into place. Janet Tacy of Sand­cas­tle Cel­e­bra­tions helped sug­gest won­der­ful ven­dors to ensure a per­fect wed­ding. 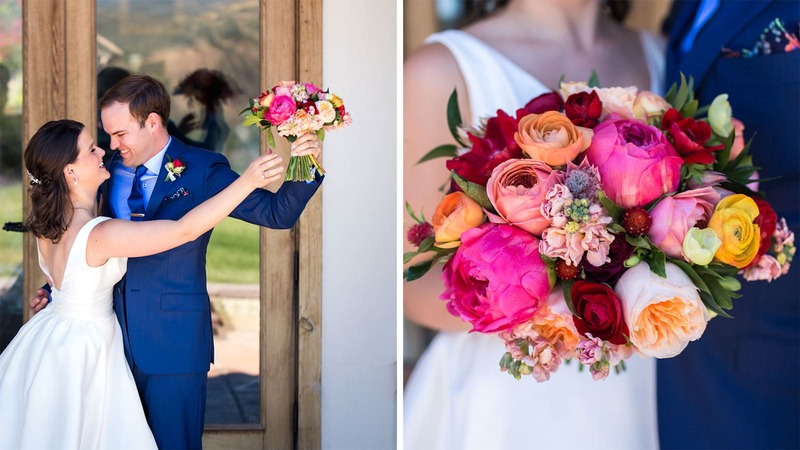 Katie of Noonan’s Designs put togeth­er gor­geous, vibrant bou­quets and cen­ter­pieces that were the talk of the wed­ding. The wed­ding invi­ta­tion suite by Brown Fox Cre­ative was inspired by the beau­ti­ful flow­ers and Bai­ley of Bour­bon Blue Cards cal­ligraphed the love­ly seat­ing chart and signs. And how could we for­get the cake from Just Baked SLO! It was tru­ly a beau­ti­ful wed­ding with all the per­fect details, but even bet­ter, it was filled with joy, love and laugh­ter! Con­grat­u­la­tions to Patrick and Julie! It was an hon­or to pho­to­graph Patrick and Julie’s wed­ding at Casitas Estate and work with all their amaz­ing ven­dors. I can­not wait to pho­to­graph anoth­er wed­ding at Casitas Estate!